Index map showing the 1:100,000-scale geologic maps that cover Millard County. 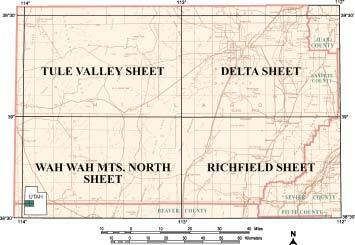 Name of each sheet is taken from the principal U.S. Geological Survey 30- x 60-minute topographic quadrangle covering the area, although strips of the following quadrangles were also geologically mapped to cover the western and northern edges of the county: Garrison, Ely, Kern Mountains, Fish Springs, and Lynndyl. In the fall of 2003, the Utah Geological Survey published the last parts of one of its largest and longest running projects, a comprehensive study of the geology of Millard County in westcentral Utah. The county is geologically important because it contains a six-mile-thick, exceptionally complete and well-exposed record of the past nearly billion-year geologic history of the western United States. This major study was conducted mostly by Dr. Lehi F. Hintze (see companion article), one of Utah’s most wellknown and published geologists, and the namesake of the newly created Lehi Hintze Outstanding Geologist Award (with Lehi as its first recipient). The Millard County publications are four 1:100,000-scale, color geologic maps (index map) and a roughly 300- page bulletin (see list at end of article). These publications will be invaluable to earth scientists (geologists, paleontologists, geophysicists, geochemists, and other specialists) for decades to come. The maps and bulletin cover more than 6,600 square miles and are the products of over a half century of geologic studies by Dr. Hintze, with major contributions from coauthor Fitzhugh Davis (Utah Geological Survey, retired), Myron Best (fellow Brigham Young University professor), Jack Oviatt (Kansas State University), and Dorothy Sack (Ohio University). With a reference section that runs over 25 pages, the bulletin is a scientific treatment of the geology of the county. In particular, the bulletin covers the stratigraphy, sedimentology, paleontology, structural geology, and geophysics of the area. With over 200 figures, including numerous photographs of vistas and fossils (page 4), the bulletin will also enable rockhounds and fossil collectors to better understand the significance of Millard County’s outstanding geologic heritage. Direct work on these publications began in 1986. Prior to 1986, Dr. Hintze, with the aid of BYU geology professors and students, had mapped much of the bedrock in Millard County, typically exposed in the mountain ranges. However, little geologic mapping had been done in the valleys (Quaternary deposits) of western Utah. In 1986, Oviatt and Davis began mapping the Quaternary (less than about 2-million-year old) deposits and rocks that cover more than two-thirds of Millard County, and the fault scarps in these deposits. Their approach and classification system for Quaternary mapping worked well and Oviatt, Davis, Sack, and Hintze completed the Quaternary mapping of Millard County. In the bulletin, Davis describes the relative age, grain size, and consolidation (or lithification) of the 30+ Quaternary sedimentary map units in Millard County, and Hintze describes about 20 Quaternary volcanic-rock units. Together they mapped and inventoried faults that have broken the surface (formed a scarp) in Quaternary deposits and rocks (tables in the bulletin include age, scarp height, and length). These characteristics and the mapping are an aid in geotechnical engineering studies, when more detailed information is not available, and are also useful for land-use planning and assessing geologic hazards. Lastly, the Millard County bulletin contains subsurface (mostly geophysical) data including seismic reflection profiles (like those used to look for oil and gas fields), gravity profiles, a new gravity contour map (above), and lithologic well data (also known as borehole data) obtained from oil and gas, mineral, geothermal, and water exploration wells. These subsurface data provided the shape of the basin valleys buried below ground level, and were used to decide where Quaternary normal faults are located that do not have surface scarps. The following publications from the Millard County study are available from the Natural Resources Map and Bookstore. A CD of digital files of the maps, including geographic information system (GIS) files, will be released later. 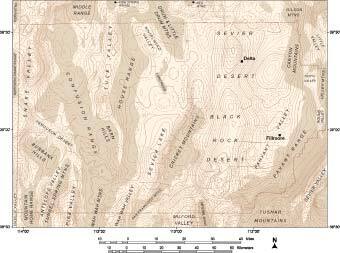 Hintze, L.F., and Davis, F.D., 2002, Geologic map of the Wah Wah Mountains North 30′ x 60′ quadrangle and part of the Garrison 30′ x 60′ quadrangle, southwest Millard County and part of Beaver County, Utah: Utah Geological Survey Map 182, scale 1:100,000. Hintze, L.F., and Davis, F.D., 2002, Geologic map of the Delta 30′ x 60′ quadrangle and part of the Lynndyl 30′ x 60′ quadrangle, northeast Millard County and parts of Juab, Sanpete, and Sevier Counties, Utah: Utah Geological Survey Map 184, scale 1:100,000. Hintze, L.F., and Davis, F.D., 2002, Geologic map of the Tule Valley 30′ x 60′ quadrangle and parts of the Ely, Fish Springs, and Kern Mountains 30′ x 60′ quadrangles, northwest Millard County, Utah: Utah Geological Survey Map 186, scale 1:100,000. Hintze, L.F., and Davis, F.D., 2003, Geology of Millard County, Utah: Utah Geological Survey Bulletin 133, 303 p.
Hintze, L.F., Davis, F.D., Rowley, P.D., Cunningham, C.G., Steven, T.A., and Willis, G.C., 2003, Geologic map of the Richfield 30′ x 60′ quadrangle, southeast Millard County and parts of Beaver, Piute, and Sevier Counties, Utah: Utah Geological Survey Map 195, scale 1:100,000. Glad You Asked: What Kind of Rock Makes a Good Wall?